In 2002, Cynthia Germain created Saint-Germain to capture the spirit of Africa in design. 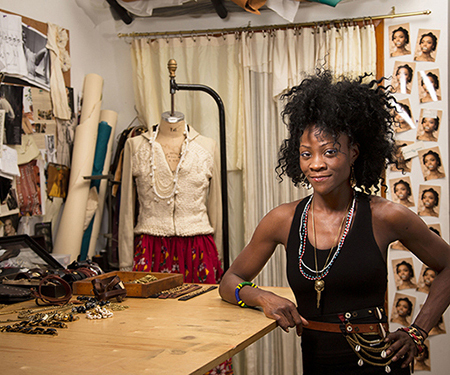 She crafts leather, printed cloth, and metals into boho chic specialty items, jewelry, and apparel. These raw materials reflect their time and place of origin, and the finished pieces seem to hold history and share their story with the wearer, like an heirloom or an artifact.Influences for the collection came while visiting family in 2000 in Niger, West Africa. Little did she know that this inspirational voyage would redefine her sense of beauty. Surrounded by tall slender bodies adorned with eye catching beads and draped cloth, she discovered a style unseen in the States. This experience opened a new vista for urban fashion that she continues to explore.This collection includes leather embellished cuffs, watch bands, hand decorated belts, hand printed leather scarves, & eye catching leather holsters. The pieces are made from plush hides and exposed to special treatments for a one of a kind look and feel. Cynthia infuses the enduring raw materials with an African mystique and a rock and roll edge, befitting a world traveler that appreciates the timeless and the new.Saint-Germain is located in Brooklyn, New York, where Cynthia continues to bring elements of Africa to the city, one hand crafted design at a time.